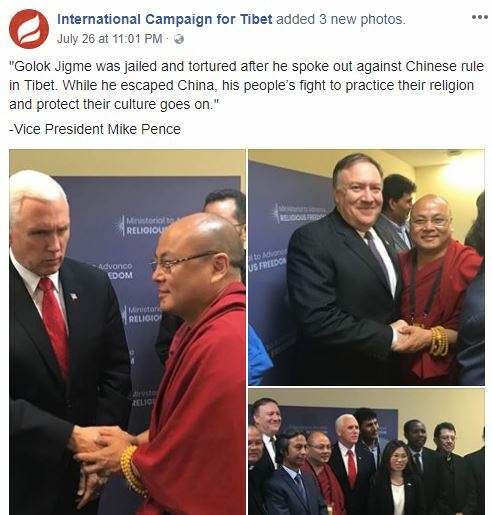 Golok Jigme, a Tibetan monk and activist who was arrested and tortured for speaking out against China’s oppressive rule, discussed the situation in Tibet with U.S. Vice President Mike Pence and Secretary of State Mike Pompeo. The first-ever Ministerial to Advance Religious Freedom hosted by the US Department of State is the trending story on our social media sites. The three-day event held from 24 to 26 July, saw leaders from around the world discuss the issues facing religious freedom and how to alleviate the discrimination and persecutions based on religious grounds; and to promote religious freedom and ensure religious liberty for all with the participation of leaders from around the world. The three-day event was hosted by Mike Pompeo, the US Secretary of State. The gathering witnessed a coming together of representatives from 80 countries comprising of elected officials, survivors of religious persecutions and religious leaders. Golog Jigme, a former political prisoner who fled Tibet in 2017 was among the survivors of religious persecution who attended the ministerial along with elected officials, civil society members, and religious leaders. Golog Jigme in his meeting with the Vice President and the Secretary of State urged the US to push Chinese leadership to negotiate with the representative of the Dalai Lama to resolve the Tibet issue. 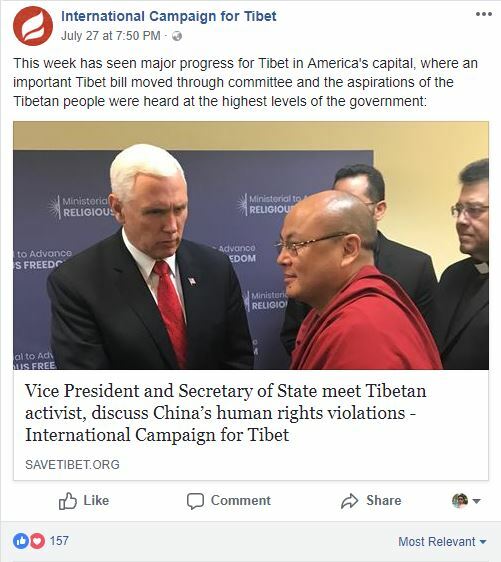 The former political prisoner and Buddhist monk also apprised Mike Pence and Mike Pompeo of the dire state of religious freedom and human rights in Tibet. Jigme explained that Tibetans are not allowed to listen to His Holiness the Dalai Lama’s teachings and the possession of His Holiness’s portrait illegal. He also appealed for an immediate release of 11th Panchen Lama, the second most revered spiritual leader of Tibetan Buddhism, who was abducted by the Chinese government in 1995 and his whereabouts and wellbeing unknown since his abduction 23 years ago. A video message from His Holiness the Dalai Lama was also screened during the second day of the ministerial. His Holiness in his message stressed the importance of promoting religious harmony. 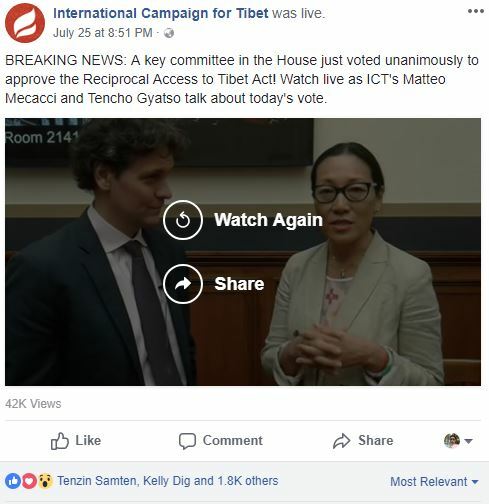 In an important development for the Tibet supporters and Tibetans, the U.S. House Judiciary Committee unanimously approved the Reciprocal Access to Tibet Act, a legislation that seeks to combat China’s attempts to isolate Tibet from the outside world. Ngodup Tsering, the representative, Office of Tibet, North America and Demo Rinpoche attended the conference. The Karmapa attended the session on July 26.